Click here to download your photos with Chelsea Clinton. 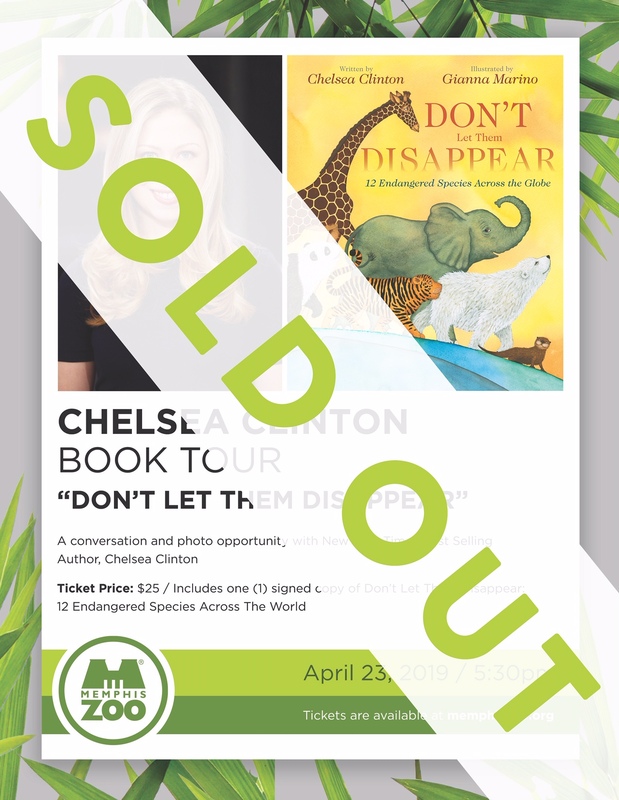 Chelsea Clinton will appear at Memphis Zoo on April 23 for an evening conversation to discuss her new children's book "Don't Let Them Disappear" and a photo opportunity. Chelsea Clinton will appear at Memphis Zoo to discuss her new children’s book “Don’t Let Them Disappear: Twelve Endangered Species Across the Globe,” which introduces young readers to a selection of endangered animals and shares what makes them special—and also what threatens them. Taking readers through the course of a day, the book talks about rhinos, tigers, whales, pandas and other endangered animals, and provides helpful tips on what we all can do to help prevent these animals from disappearing from our world entirely. $25 includes one (1) pre-signed copy of "Don't Let Them Disappear" and admits you and up to three additional family members to the event. You must print out and bring your ticket confirmation for admission to the event. Event starts at 5:30 p.m. on April 23, 2019, gates open at 5 p.m. Adult family members must have named I.D. The event will begin on time, so please allow plenty of time to get from the parking lot to Teton Trek.